Turquoise Mesa Winery is at at 11705 Teller St., Suite C. The tasting room is open from 1 to 6 p.m. Thursday through Saturday. Cost: $5 for six tastings. Wine also is available by the glass for $6. For more information, visit Turquoisemesawinery.com. 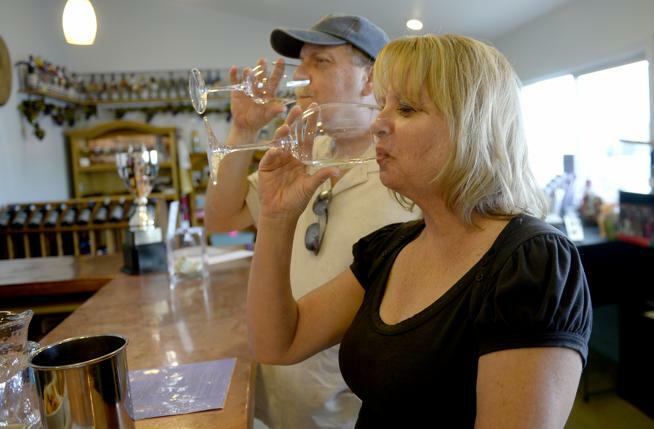 One might not expect a winery to find a home in Broomfield, let alone an award-winning one. Turquoise Mesa is a bit off the beaten path, in a strip of industrial condos, but those looking for the tasting room and production warehouse need only look for the turquoise sign with the bright golden sun pointing the way. Tom, a retired engineer, and Mary Joan, a retired school teacher, started producing wines with two other families and it’s grown ever since. Wine bottles line the walls of the winery’s 3,300-square-foot space, medals hanging from dozens of them. The newest award is a large, gleaming trophy from the Governor’s Cup Competition, which the Buebs won in May for their 2013 Syrah. The May 16-17 event was hosted by the Colorado Wine Industry Development Board (CWIDB), part of the Colorado Department of Agriculture. Turquoise Mesa tied for Best of Show, and also earned a second spot in the Governor’s Cup Case for its 2013 Colorado Crimson. A panel of 15 judges comprised of sommeliers, winemakers, writers and wine experts from around the country selected the top 12 wines and also four top ciders, meads and fruit wines from 241 submissions from 37 local wineries. The Buebs are known for their Rhone varietals and blends, and get their grapes from the Western Slope to produce limited quantities of handcrafted wines. Tom Bueb said he believes in quality over quantity, though the winery has bumped up production and increased volume. During a few hard years when availability of grapes was down because of winter freezes, Turquoise Mesa produced 800 to 900 cases each year; now the winery is producing just under 1,400 cases a year. The 2013 Syrah that took Best of Show is made with 100 percent Colorado grapes from Talbott Farms. It’s a mild “New World” wine and aged in the wine barrels for nearly two years. It’s 13.5 percent alcohol with an oak-like aroma. The Colorado Crimson is a Rhone-style blend from the same Syrah with black pepper, leather and cedar characters, combined with a floral, fruity character. The Buebs primarily run the winery, with help from two part-time employees and volunteers. Turquoise Mesa and its award-winning wines are among a crop of Colorado wineries coming into their own. More info: Tasting will feature the top 12 Governor’s Cup Colorado wines, plus small plate pairings featuring locally sourced ingredients from six Colorado chefs. For more information, call 303-447-8679. Chris Lamson, the wine department manager at Superior Liquor, has been in the industry for 20 years and said he’s seen a “ton of improvement” in Colorado wine, adding that the industry has taken a “quantum leap” from a hobby into the professional arena in the past 10 years. “It’s moving quickly from what was a tourist-based industry into a professional wine-making industry,” he said. Lamson sees price point as the only limiting factor to Colorado winemakers, in that it’s tough to get a customer to try a new bottle of wine at $15, instead of $10 or even $12. Because local “boutique wineries” are producing a smaller volume versus larger producers in California, for example, they’re pushed to charge more, which is natural across the country. Zimmerman said he has watched the Colorado wine industry go through a period of education and there’s been a lot of trial and error in terms of what to plant and where to plant it. “It takes years to perfect. I am a believer that Colorado is capable of high quality world-class wine,” Zimmerman said. One third of the top winning wines at the May Governor’s Cup Competition were Syrahs. Mary Joan Bueb has noticed its popularity grow at Turquoise Mesa’s tasting room, too. “Everybody knows each other and it’s like a family. My granddaughter even learned to walk here,” Cindy Barber said at the winery Thursday, pointing to the walkway in the tasting room where Harper McNaughton, almost 2, took her first steps. Mike Barber said he and his wife were surprised when they stumbled upon the winery five years ago in its former location.